A review of a comfortable three-star hotel across from the Venezia Mestre railroad station, where frequent commuter trains run directly to Venice's historic center. Save money and hassle on parking. Given the fact that most tourists are visiting Mestre to cut their travel expenses, you might expect Mestre's hotels to be dull and ordinary. Happily, that isn't always the case, as I discovered when I stayed at the Best Western Hotel Bologna, which has catered to leisure and business travelers since 1911. ABOVE: Room 361, a "Look" double in the Hotel Bologna's south wing. 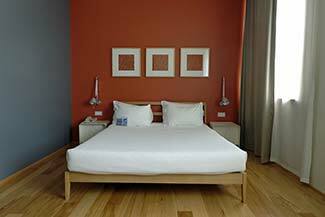 All rooms have central air conditioning, flat-screen TVs, free Wi-Fi, and other amenities. Bathrooms are well-equipped, with either tubs or walk-in showers. Downstairs, you'll find an attractive lobby with a lounge, travelers' book exchange, half a dozen or so Internet terminals (available to guests at no charge), a bar that serves snacks, a gourmet restaurant that serves Venetian dishes, and an informal "quick lunch" restaurant. A buffet breakfast is included in the rate, and parking is available at extra cost (about 10 euros a day during my visit, or a third to a half of what you'd pay to park at the edge of Venice's city center). Best of all, the Best Western Hotel Bologna is directly across the street from the Mestre Railroad Station, where trains from Mestre to Venice run almost constantly from morning through late evening, taking only 10 to 12 minutes to reach the centro storico for a little over one euro. The Mestre Airport Bus from Venice Marco Polo Airport also stops just 50 meters down the street from hotel. To check the lowest available prices for the dates of your visit to Venice or Mestre, see Booking.com's Best Western Hotel Bologna pages. For more captioned photos of the Best Western Hotel Bologna, go to page 2 of this article.